Rooms 2, 3 & 4 are R1100.00 per night, for a single, including breakfast and VAT. 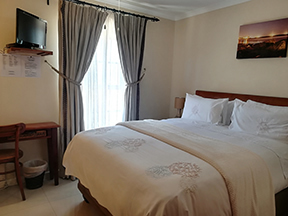 Rooms 2, 3 & 4 are R1900.00 per night, for a double, including breakfast and VAT. Rooms 5, 6, 7, 8, 9, 10, 11, 12 & the flat are R1000.00 per night, for a single, including breakfast and VAT. Rooms 5, 6, 7, 8, 9, 10, 11, 12 & the flat are R1800.00 per night, for a double, including breakfast and VAT. Visitors of guests can enjoy breakfast at R100.00 per head. Credit card facilities available including all major credit cards as well as Diners Club and American Express. No refunds will be given once the deposit has been paid. Full settlement of your account is required upon arrival. Children of age 12 and over are charged as adults. Children under 12 years are half price, under 3 years free. Just after Raapenberg off-ramp, keep left and take the Milnerton exit (M5). Follow the M5 and take the N1 direction City. Stay in left lane. After about 2 km's take the Paarden Eiland/Milnerton exit. Turn right at stop street. Follow the R27 and drive past Paarden Eiland Industrial Area, Lagoon Beach, Woodbridge Island, Milnerton Golf Course on your left, and Sunset Beach residential area. Turn Left at traffic light towards Bloubergstrand/Atlantic Beach into Marine Drive. Pass Dolphin Beach Hotel on your left. Drive along Marine Drive (Ocean on your left). Pass one traffic circle and drive until you reach a low wall on the left that reads BLOUBERGSTRAND. Turn left into the first street after the low wall which is Sir David Baird Drive. Turn Left and pass the Blue Peter Hotel on your right. Continue straight into Verkouteren Street. (Cul de Sac). We are 2nd house on the left, no. 6, Big Cape Dutch Gable House.